Crossposted from Checks & Balances Project. In yet another investigation into the Obama Administration’s activities, the State Department Inspector General is probing the conflicts of interest surrounding the contractor that performed the Keystone XL review,. The American public was supposed to get an honest look at the impacts of the Keystone XL pipeline. Instead, Environmental Resources Management (ERM), a fossil fuel contractor, hid its ties from the State Department so they could green light the project on behalf of its oil company clients. Hiring an oil company contractor to review an oil pipeline that its clients have a financial interest in should be illegal - and it is. The Federal Government has strict laws to avoid conflicts of interest and prevent the hiring of contractors who cannot provide unbiased services. 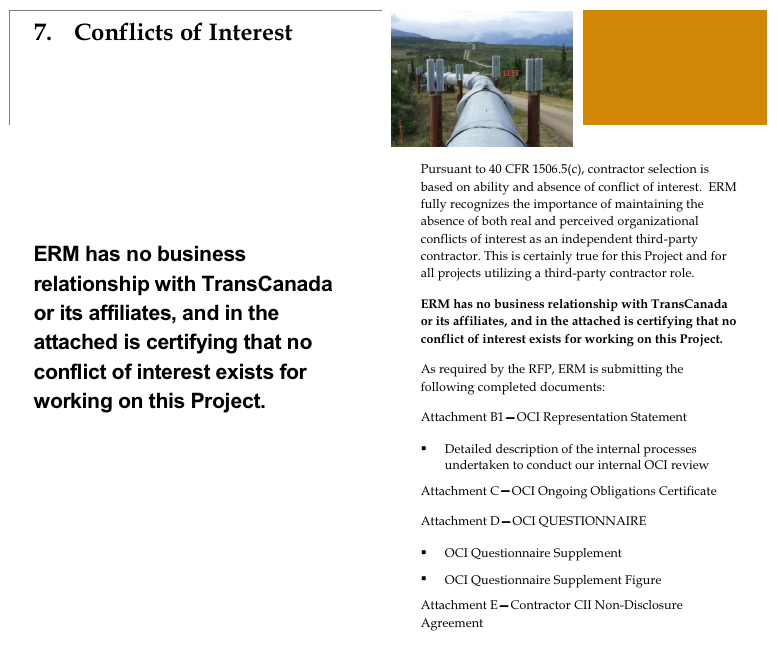 Unredacted documents from the contractor’s proposal (revealed by Mother Jones) show that the company had worked for TransCanada, ExxonMobil and other fossil fuel companies that have a stake in the Canadian Tar Sands. But, ERM misled the State Department at least twice in its proposal (see C&BP's original post on ERM's conflicts of interest)– which may have led to its selection by the State Department to review the Keystone XL pipeline. Crossposted from Greenpeace blogs and PolluterWatch.